How did the rebel become one of the greatest of all time? There are players who are synonymous with greatness in the world of basketball. Michael Jordan, Earvin ‘Magic’ Johnson, Larry Bird, the list is endless. These men are just some examples of all that is good about a great sport whose names have become legend. 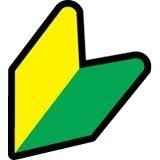 They are decorated with championships and personal accolades. Their image fits the criteria that the National Basketball Association (NBA) expects in order to promote their image to fans all over the world and they truly were the greatest of all time in the eyes of many. Somewhere along the way though there comes a player who does not fit this model, a player who isn’t looked at as the shining example of excellence and greatness. There is often an outcast who may bend the rules a little, who may not look or dress exactly how people want him to or behave how they expect him to. So exactly how does a player like this become one of the greatest of all time? I am referring of course to Dennis Rodman. Dennis Keith Rodman debuted in the NBA at 25 years of age with nothing on his mind except to play hard and give these superstars the toughest challenge of their careers. Dennis Rodman did not care about personal glory, fame, wealth or accolades, he knew he was lucky to be where he was and he was damn sure going to enjoy every second of it. Born in Trenton, New Jersey, Dennis Rodman was raised by his mother who had moved the family to the crime-riddled Oak Cliff section of Dallas, Texas along with his two sisters Debra and Kim. 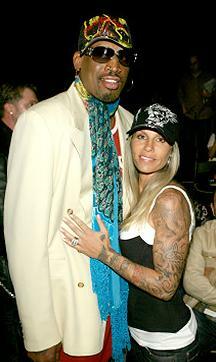 It is believed that Rodman’s father, Philander Rodman Jr, has fathered 29 children by 16 different mothers after leaving his family when Dennis was only 5 years old. Being raised in a household that was predominately female, Dennis never received the love and attention that he craved from a mother who was too busy working to support her family and this left him shy and insecure around pretty much everyone, especially women. Dennis, unable to fit in with anyone, assumed that he would just end up as another loser who would do nothing with his life. His life would change though when he experienced a growth spurt in his teens where he grew from 5’9” to 6’8” and he began playing high-school basketball although he was not considered a stand-out. Despite struggling at first, Rodman was awarded a scholarship to South Eastern Oklahoma State University where he became a three time NAIA (National Association of Intercollegiate Athletics) champion and led the NAIA in rebounding in the 1983/84 and 1985/86 seasons. Rodman was taken in by the parents of his new friend Bryne Rich in 1982 and lived with his ‘adopted family’ on their farm for the next four years where he learned the values of hard work, something that would be beneficial to Rodman in his career. Life changed for Dennis Rodman forever in 1986 as he was selected as the 27th overall pick in the NBA Draft by the Detroit Pistons, coached by Chuck Daly. Rodman was just happy that someone was giving him the chance and he quickly found that he was in a place where he could be comfortable alongside the likes of team-mates Isiah Thomas, Bill Laimbeer and Joe Dumars. The hard-hitting and rugged Pistons steamrolled their way through the NBAs Eastern Conference and earned themselves the nickname ‘The Bad Boys’. By his second year with the Pistons, Rodman was averaging 15 minutes per game off the bench at the small forward position and showed that he had a talent for tough defense. He was not afraid to dish out hard fouls, dive for loose balls or gather up rebounds in amongst opposition players. Dennis took care of ‘the dirty work’ which not many players in the league liked to do as they were too concerned with scoring points and having their name in lights. 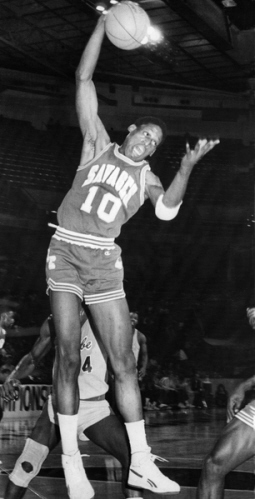 He became a rebounding specialist on a par with the likes of Wilt Chamberlain and Bill Russell and seemed to have an almost psychic ability to anticipate which direction the ball would take following a missed shot. Dennis made ‘the dirty work’ fun to do and to watch and you could say he pretty much made it marketable. Dennis also made it his personal mission to upset the ‘superstars’ on opposing teams and make life very uncomfortable for them during games. Rodman was unique in the sense that he could guard any player from the opposing team no matter who it was or what position he played and he could get into the head of the opposition, frustrating them and making the game as difficult as possible for them. 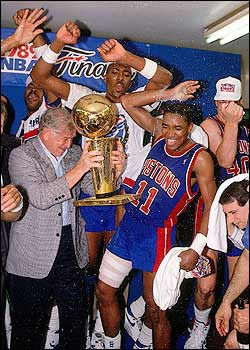 The Pistons continued to bully their way through the league and reached the pinnacle of success by winning the NBA championship in both the 1988/89 and 1989/90 seasons. These championship runs would be remembered mostly for the bruising battles with the Chicago bulls (and the NBAs poster boy Michael Jordan) in the Eastern Conference Finals of each season, with Rodman and the ‘Bad Boys’ coming out on top both times. Dennis’ hard work and determination paid off as he was also awarded with the NBA defensive player of the year award in 1989/90 and again in 1990/91. Life as an NBA player was a roller-coaster ride right from the start for Dennis. In Detroit, he was playing in a city that appreciated his hard work and loved the hard-hitting style of the Pistons. He was still the same shy and insecure kid and in Coach Daly, Dennis had found someone who he could look at as a father figure. Chuck Daly took care of Dennis from the moment he arrived in the NBA, guiding him on and off the court and Dennis was grateful to have him in his life. After the glorious championship years, things began to change for the Pistons and for Rodman. The Pistons met the Chicago Bulls in the Eastern Conference Finals yet again in 1990/91 only this time the Jordan-led Bulls swept the Pistons in four games and went on to dominate the basketball world for most of the 90s. The Pistons started to break apart after that season as key players were traded away and the team could not reach the same level as in previous years. Despite the problems, Dennis continued to perform on the court as he averaged 18 rebounds per game and he won the first of what would be seven consecutive rebounding titles. Rodman suffered an emotional loss in the 1992/93 season as his friend and mentor Chuck Daly resigned and left Rodman feeling alone again, without his ‘father figure’. The once NBA champion Pistons did not even make the playoffs and were a shell of their former selves. Off the court, Rodman’s marriage to model Annie Bakes lasted 82 days and she was awarded custody of their four year old daughter Alexis. Dennis felt as though his life was crashing down in front of him and he did not like the person that he had become. If only there was a way to hit the ‘reset’ button and start all over again. In February 1993 Dennis Rodman sat alone in his pick-up truck in the empty parking lot of the Palace of Auburn Hills Michigan, home of the Detroit Pistons. With Pearl Jam on the stereo, Dennis sat with a rifle on his lap wondering if he should end it all as he was tired of trying to fit in with what the NBA, the fans and the media all wanted him to be. Rodman has since revealed that he never intended to kill himself but instead wanted to be in the position where he would have to force himself to make a choice: end it now or change it up. Dennis made his choice, and said goodbye to the old Rodman. With his career as a Detroit Piston over, Dennis was traded to the San Antonio Spurs in the summer of 1993. Then 32 years old, Rodman saw this as a new beginning and a chance to change his image and his outlook on life. With his ‘family’ now having gone their separate ways Rodman decided to just go out and have fun and play his game and to hell with what anyone thought. He got some tattoos and after appearing with a new dyed blond hairstyle he took the NBA by storm. Not only did have blonde hair, he also thought it would be fun to dye his hair green, yellow, pink, blue, every colour imaginable, even multi-coloured. He also wasn’t afraid to speak his mind, much to the annoyance of officials and sometimes his team-mates and fans. The reaction from the general public was overwhelming, and probably a little over the top, as Dennis brought flair, flamboyance and controversy to Texas in a town of church-goers and folk who liked the simple life. Dennis was not interested in making friends though as he only wanted to play basketball and win. Every game that Dennis played, with his multi-coloured hairstyles, he gave it everything he had, and the fans knew it. Dennis always wanted to give the fans what they wanted and to make sure they left the building that night having got their money’s worth. With winning still his main concern, he continued to dominate on the boards and was not afraid to mix it up with the big men in the league. 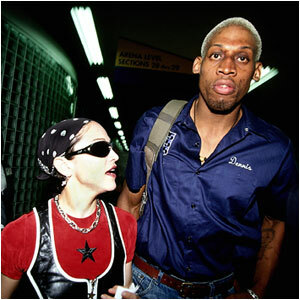 It was around this time that Rodman began to enjoy the celebrity lifestyle and even had a high profile relationship with Madonna, making headlines away from the sports sections. This new lifestyle clashed with the Spurs golden boy “The Admiral” David Robinson though, as he and Dennis were polar opposites of each other. Robinson, a former officer in the U.S. Navy was not impressed with the flamboyance and ‘speak your mind’ attitude of his new team-mate and tried several times to introduce God into Dennis’ life. Dennis was too busy having fun to talk with God though and didn’t care what anyone thought about him and continued to do his job and he did it well. The Spurs organization, particularly owner Greg Popovich, was not impressed with the antics of Dennis Rodman and labelled the player a distraction although Dennis thought he was merely a scapegoat for the Spurs problems. He would make sure that someone kept an eye on Rodman off the court to make sure he behaved himself. 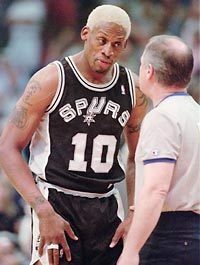 Following disputes over contract negotiations, Popovich decided that the Spurs would be better off without Rodman for the upcoming 1995/96 season. Would anyone ever accept Dennis for who he is? ‘Would you like to be a Chicago Bull?’ asked Coach Phil Jackson. ‘I don’t give a damn if I’m here or not’ was the response from Dennis Rodman. ‘Congratulations, you’re a Chicago Bull’. 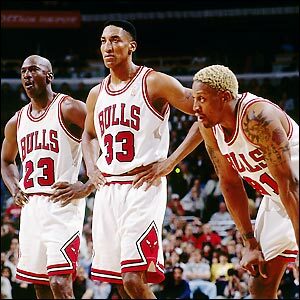 Prior to the 1995/96 season Rodman was traded to the Chicago Bulls for Will Perdue and cash considerations and would join up with the ‘greatest player to ever play the game’ Michael Jordan. The move was met with scepticism by many journalists and fans alike and was considered a huge gamble as they were unsure as to just how Rodman’s attitude would fit in with the Bulls, especially with the previous rivalries with Michael Jordan and Scottie Pippen. All doubts were quickly laid to rest though as there were no hard feelings between the players while the fans, the people of Chicago and his team-mates all appreciated the hard working attitude and the ‘entertainment value’ that he brought to the team. In Chicago Dennis, and the Bulls, were treated like rock stars. Dennis was a free-spirit and continued to live his life the way he wanted regardless of what anyone thought of him. He would go to gay bars, wear women’s clothes, paint his nails, party and sleep with more women than we could probably count. 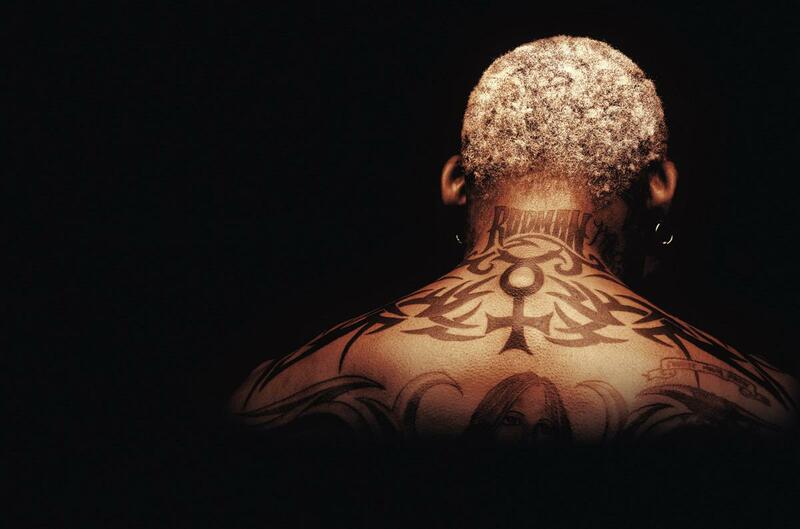 Shortly after signing with the Bulls, Rodman released his autobiography ‘Bad as I Wanna Be’ and showed up to the book signing in New York wearing a wedding dress, claiming that he was bi-sexual and that he was going to marry himself. He was truly embracing the rock star lifestyle. On the court though, Dennis was all business. Once again he led the league in rebounding and averaged 14.9 rebounds per game. As part of Coach Tex Winter’s famous triangle-offense strategy, Dennis’ offense was not a priority and his scoring average reduced to 5.5 points per game. Rodman’s role on the Bulls was all about the defense and rebounding. Despite having a fantastic season with his new team, Dennis couldn’t help but bring some controversy. In a March 1996 game against the New Jersey Nets, Rodman was ejected and also received a 6 game ban and a $20,000 fine for head-butting a referee. In Chicago, Coach Phil Jackson let Dennis be Dennis. Whenever he did something stupid, Jackson would simply laugh it off and remember that he used to do similar things when he was a player, although he did fine Rodman every time. This was a much more lenient approach than he was used to in San Antonio. Jackson was pleased to have a player who wanted to win so badly and brought nothing but hard work to practices and to the court and Dennis appreciated Phil Jackson for allowing him to be the person he wanted to be. Jackson called the acquisition of Rodman a “risk-reward” proposition. This little setback didn’t stop Dennis and The Bulls though as they finished the 1995/96 regular season with a record-setting 72 wins out of 82 regular season games and captured the NBA Championship for the fourth time in six years. In the NBA Finals against the Seattle Supersonics, the Bulls won the series four games to two and Dennis’ performances in games two and six drew praise from the Sonics Coach George Karl who claimed that “Dennis Rodman won them two basketball games”. He had earned the respect of the Chicago Bulls fans and team-mates for his hard-working attitude throughout the season and it looked like he was finally being accepted for who he was. Following the record-setting season, the rock star status of Dennis Rodman continued to grow and Dennis was happy to soak it all up. He continued to party and have as much fun as possible. He even starred in ‘Double Team’, an action movie starring international superstar Jean-Claude Van Damme. This lifestyle did not seem to distract Dennis as the Bulls captured their 5th NBA Championship in 1997. In a January 1997 game against the Minnesota Timberwolves, Dennis again created headlines for the wrong reasons as during a play, he tripped and fell over some recording equipment and in the heat of the moment, kicked out at photographer Eugene Amos, who held his groin in agony in an attempt to make the situation worse than it was. The antics of Mr. Amos were pretty pathetic as the kick was no-where near his groin although kicking out at a photographer is not a good idea even if he does feign injury and the league would punish Rodman yet again. 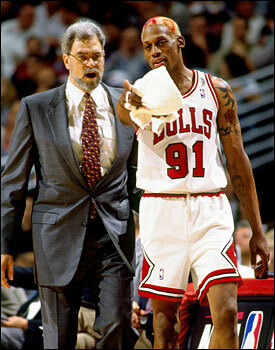 Rodman was suspended for 11 games without pay and Mr. Amos received a handsome settlement from Rodman for $200,000. The 1997/98 season saw Dennis Rodman lead the league in rebounding for the 7th straight season as he helped the Chicago Bulls win their 6th NBA Championship in eight years. The party lifestyle began to take its toll on Rodman as drinking was pretty much the only way this shy person could come out of his shell and talk to people and have confidence. He lost his place in the starting line-up during the season but when he was on the court he continued to amaze and give everything he had. On the court, no-one worked harder than Dennis Rodman. Off the court, no-one played harder. Rodman at this point was probably more famous off the court than he was on it and even claimed that he was ‘more famous than the game’. 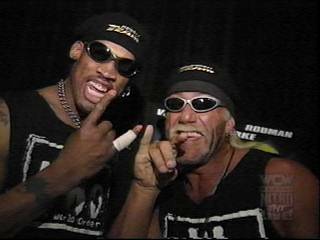 During the NBA Finals series against the Utah Jazz, Rodman angered Bulls coaching staff by leaving prior to game 4 to compete in a World Championship Wrestling (WCW) event with Hulk Hogan. He was fined $20,000 and still took part in the game and did what he did best. I think that was the best part about Dennis Rodman, the fact that prior to games he could fly to Las Vegas or spend the whole night partying and drinking, arriving back just in time for games, yet still produces his best performance on the court. When Dennis stayed in his room and did what he was told he usually didn’t play very well the following game, but when you let Dennis be Dennis, only good things happened for your basketball club. 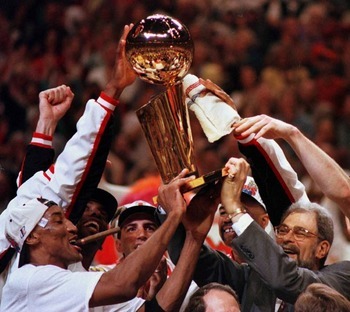 After winning their 6th NBA Championship the Chicago Bulls general-manager Jerry Krause decided to gut the team rebuild from top to bottom. Key players were released, traded or retired. It was the end of an era, a dynasty was over. 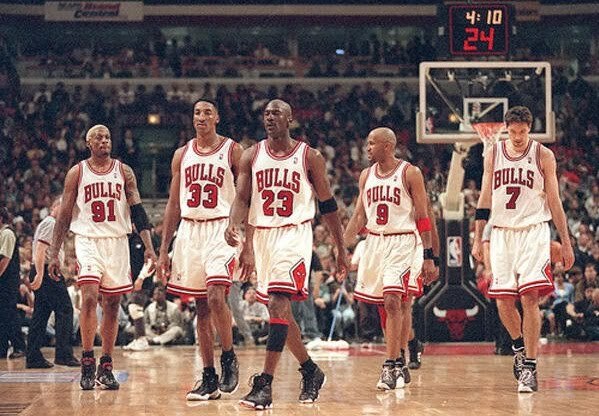 Both Michael Jordan and Scottie Pippen were gone, along with Coach Phil Jackson. Dennis Rodman was released on January 21st 1999, prior to the lockout-shortened 1998/99 season. It had happened again, Dennis was introduced to a family atmosphere in a city that appreciated him and now he was moving on. The party was just getting started though. In February 1999, Dennis Rodman signed with the Los Angeles Lakers for the remainder of the 1998/99 season, a move which should have gone down in history. It was clear though that this was not the same Dennis Rodman. His heart just didn’t seem to be in it anymore but he still craved the spotlight. He was now married to Baywatch beauty Carmen Electra but the marriage only lasted six months. 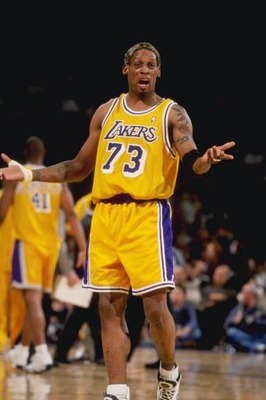 Rodman played 23 games for the Lakers who eventually got tired of his antics as he continually showed up late for practice and missed key games. Dennis continued enjoy the lifestyle he was now famous for and despite being 38 years old, he was still willing to stay in the NBA. Unfortunately very few NBA teams were willing to take a chance on Rodman due to his outrageous behavior. New Dallas Mavericks owner Mark Cuban had other ideas though. Not afraid to spend money, Cuban recruited Rodman during the 1999/00 season with the hopes that the star attractions would sell tickets and garner interest for his team. Dennis only played 12 games before he was released and it appeared that he had blown his last chance. In 2003, after spending the night at a Las Vegas strip-club, a motor-cycle accident almost cost Dennis his life and this appeared to be the wakeup call that he needed. He decided that it was time to take his life seriously. After marrying Michelle Moyer in 2003, Dennis continued with his hard-partying lifestyle however his motorcycle accident has changed his outlook on life. Dennis had a responsibility to be a better husband to Michelle and father to his children Alexis, DJ and Trinity. While teams were getting ready for the 2003/04 NBA season, Dennis Rodman was getting ready to play for the Long Beach Jam of the newly formed American Basketball Association (ABA). Dennis brought a wealth of experience to Long Beach and helped coach and tutored the younger players. He also helped them clinch the ABA title. Now sober, it was his hope was to make a dramatic comeback to the NBA however this appeared to be a long shot. Despite a huge change in his lifestyle teams were unwilling to take the chance on Dennis. From 2003 to 2006, Dennis played for several teams around the world including the Orange County Crush and the Tijuana dragons of the ABA and a one game appearance for the Brighton Bears of the British Basketball League. The NBA comeback never materialized though and Dennis shifted his focus to a film and TV career, and also took part in several pro-wrestling events. After turning his life around Dennis knew that when he looked back on his life and career, he wanted to leave a legacy that his children could be proud of. Accompanied by his wife and his kids, Dennis was inducted into the Naismith Memorial Basketball Hall of Fame on April 4th 2011. Dennis Rodman will now be remembered among the greatest of all time in the basketball world. 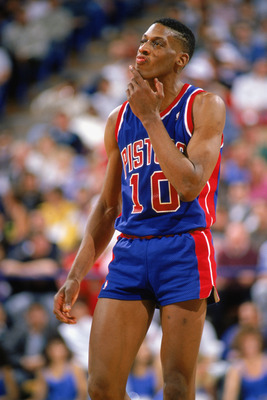 Not only is Dennis enshrined in the Basketball Hal of Fame but on the 1st of April 2011 the Detroit Pistons retired the number 10 jersey famously worn by Rodman during the ‘Bad Boys’ era. Dennis had finally turned his life around and just maybe, he was ready to settle down with his wife and kids and be a husband and father. However in 2012 Dennis Rodman is now broke and separated from Michelle and owes $808,935 in child and spousal support. Dennis strongly denies rumours that he is ‘sick’ and ‘broke’ and vows to continue living his life the way he chooses to. In 14 NBA seasons, Rodman played in 911 games, scored 6,683 points and grabbed 11,954 rebounds, translating to 7.3 points and 13.1 rebounds per game in only 31.7 minutes played per game.NBA.com lauds Rodman as “arguably the best rebounding forward in NBA history and one of the most recognized athletes in the world”. He was ranked No. 48 on the 2009 revision of SLAM Magazine’s Top 50 Players of All-Time. Dennis was also a 5-time NBA Champion with two different teams. While some will question his induction to the Hall of Fame and his basketball legacy, there is no doubt in my mind that Dennis deserves to be there and should be forever remembered as one the greatest of all time. Tags: basketball, Carmen Electra, chicago bulls, Dallas Mavericks, dennis rodman, Detroit Pistons, Hulk Hogan, Los Angeles Lakers, Madonna, Michael Jordan, NBA, NWO, Phil Jackson, San Antonio Spurs, Scottie Pippen, WCW. Bookmark the permalink.